It's been a long journey, but finally, it's happened: Jon Hamm was triumphant at the Primetime Emmys Awards Sunday night. The Mad Men star took home the Outstanding Actor In A Drama Series Emmy award for his longtime role as the iconic Don Draper on the AMC drama series, which ended earlier this year. Of course, this is an exciting turn of events considering it was Mad Men's last year on air — and Twitter was just as excited as the rest of us were to see Hamm win an Emmy after many nominations over the years. This is the actor's first victory after 12 acting nominations: Eight for Mad Men (tied for the most for any actor), along with three for his guest role on 30 Rock and one for his guest part on Unbreakable Kimmy Schmidt. Hamm received a standing ovation from the audience at the Microsoft Theater in Los Angeles, where the Emmys were being held. 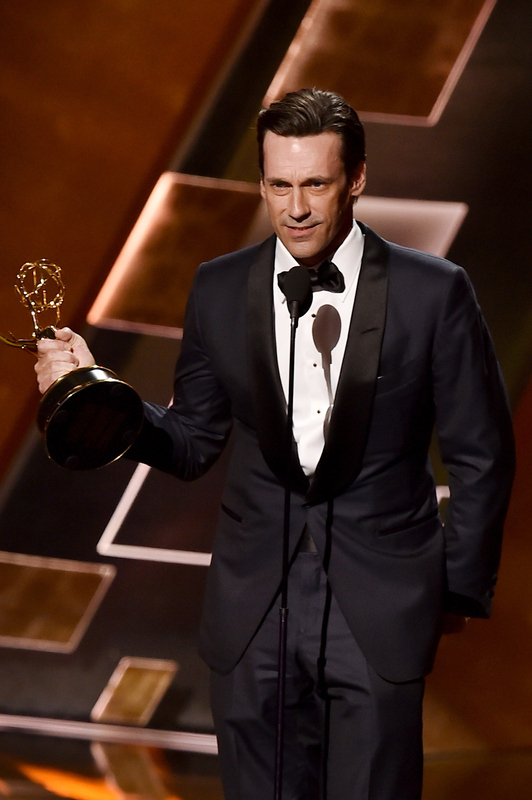 When his name was called, Hamm literally climbed onto the stage and seemed so happy to have an Emmy statue of his own. "There’s been a terrible mistake, clearly," Hamm joked, before beginning to thank those important to him in his acceptance speech: "And it’s incredible and impossible for me personally to be standing here so, I want to thank the people to whom I owe an incredible debt, people who in my life have gotten me here, families who have chosen for some reason to take me in and be nice to me along this strange strange road." Of course, Mad Men fans and Twitter were just as happy about the victory. Here are jubilant reactions to Don Draper's final triumph. Jon Hamm & Viola Davis Are Winners? YES! Right after Hamm won, Viola Davis won Best Actress, Drama, for How To Get Away With Murder. And you know if Twitter is happy, all is right with the world. (Until something else crazy starts trending.) But let's all take a deep breath and enjoy this happy moment for Hamm. After all, he's earned it.